Click on the links to see more paintings and find fun things to do. Explore Botticelli's "Venus and Mars"
Look at the wrinkly face of "An Old Woman"
Zoom in on Hogarth's "Marriage A-la-Mode: The Marriage Settlement"
Vincent Van Gogh and his painting "Sunflowers"
What is the greatest painting in Britain? "The Fighting Temeraire" by J.M.W. Turner won a poll of the British public in 2005. All about Raphael's "Madonna of the Pinks"
Click on "Whistlejacket" or "Surprise" or choose another painting in your book. 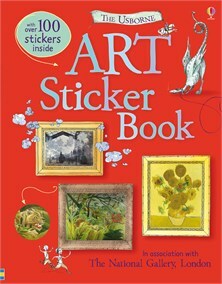 Thirty paintings, many of which feature in "The Usborne Art Sticker Book". Find out about artists and their works featured at The National Gallery.